South Africa was elected as the African Union chair for 2020. President Cyril Ramaphosa has concluded a successful working visit to Addis Ababa in the Federal Democratic Republic of Ethiopia, the presidency said in a statement this evening. 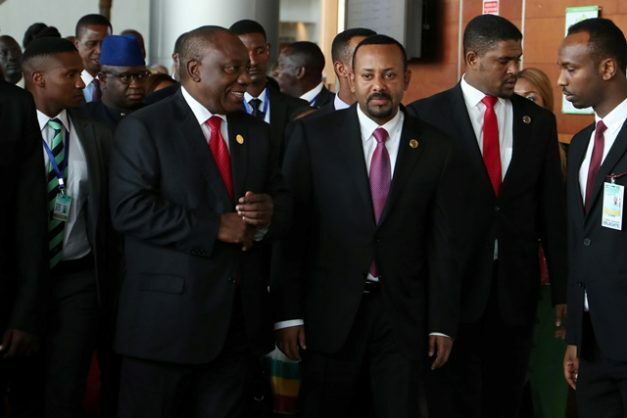 Ramaphosa led a high-level delegation of South African cabinet ministers to the 32nd Ordinary Session of the Assembly of the African Union (AU) Heads of State and Government. The assembly took place from 10 to 11 February under the theme: “The Year of Refugees, Returnees and International Displaced Persons: Towards Durable Solutions to Forced Displacement in Africa”. South Africa was elected as the AU chair for 2020. Egypt is the chair for 2019. The Chairmanship is decided annually on a rotational basis among the five regions, with the southern region being next. Ramaphosa also handed in the instrument of ratification, a formal approval by parliament of the African Continental Free Trade Area agreement (AfCFTA), to the AU Commission. AfCFTA was launched during an extra-ordinary summit of the AU Heads of State and Government in Kigali, Rwanda in March 2018. South Africa signed the agreement in July 2018 in Nouakchott, Mauritania and has now handed in the instrument of ratification to Moussa Faki Mahamat, chairperson of the AU Commission. According to the statement from the presidency, this step demonstrates South Africa’s binding and unwavering commitment to the implementation of the AfCFTA, which will remove trading barriers, boost intra-Africa trade and build an integrated and diversified market, with a GDP of approximately 3.3 trillion USD. The assembly also received and engaged with reports on a number of issues including the institutional reform and financing of the continental body; peace and security on the continent; developments related to the African Continental Free Trade Area and negotiations for a new cooperation agreement between the European Union and the African, Caribbean and Pacific developing countries post 2020. The AU immortalised the former emperor of Ethiopia, Haile Selassie, best known as one of the founding fathers of the Organisation of African Unity (OAU) of 1963, by unveiling a commemorative statue in recognition of his contribution to Africa’s liberation and unity. On the margins of the assembly, Ramaphosa attended a Southern African Development Community (SADC) meeting, convened by SADC chair and president of Namibia, Hage Geingob. The meeting received reports on the consolidation of SADC political efforts in supporting SADC member states and progress made in the implementation of the Institutional Reform of the African Union and in Post-Cotonou Partnership Agreement Negotiations. Ramaphosa held bilateral talks with several heads of state and government including the Federal Democratic Republic of Ethiopia, Democratic Republic of Congo, Republic of Zimbabwe, Republic of Mozambique, Republic of Mali, Kingdom of eSwatini and the Republic of Rwanda. He also met with the United Nations Secretary General António Guterres and leading software industry entrepreneur, humanitarian and philanthropist, Bill Gates.